Marilyn SanClemente June 16, 2015 June 16, 2015 All Occasion Card, All Occasion cards, New catalog, Stampin' Up! 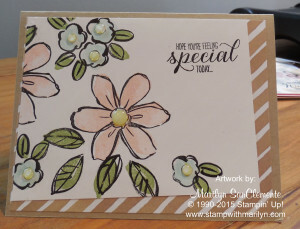 Today I am sharing a hand made card that I designed using the English Garden Designer Paper and the Garden in Bloom stamp set from the new Stampin’ Up! catalog. This card is actually a CASE from the new catalog (Copy and Share Everything) on page 119. I loved this card when I saw it and this card is actually the reason why I bought the Garden in Bloom stamp set. Last week it dawned on me, that I should feature a DSP each week and showcase a few ideas with each DSP. So here goes! So the details on this card! The background of this card is Crumb Cake cardstock. It is layered with the diagonal stripe from the English Garden DSP and I then used a piece of whisper white cardstock for the top layer. I used Black Staz-on ink to stamp the outline of the floral images. Garden in Bloom is a two part Stamp set which means that there are multiple stamps that make up one image. So you stamp the outline of the image in one color and then use a second stamp to fill in that image. The ink colors for this particular card are Blushing Bride, Soft Sky and Old Olive. Of course, you have to make every card your own. So I used the new White Perfect Accents embellishments to enhance the center of the flowers. I colored the white accents with a yellow alcohol marker. This is what the English Garden DSP looks like. The picture in the catalog doesn’t do the paper justice. I love the floral patterns in the DSP and of course had to cut into the Blue Floral design which you really can’t see in the catalog picture. Diid you see the card that I made a few days ago with the Butterfly Basics stamp set and the blue paper? Stay tuned. I have a few other cards to share with you over the next couple of days using the English Garden Designer Series Paper.